My wee space, originally uploaded by gilfling. A lovely time was had by all over the weekend! Setting up for Sneinton Artists Annual Summer Showcase on Friday along with a delightful preview with us all sitting outside drinking wine at the foot of the windmill - a beautiful summers evening well spent. A blustery day on Sunday with a steady trickle of visitors and a few wonderful wonderful sales for me! The two larger paintings in the photo have now been removed from my etsy shop as they are toddling off to Derbyshire at the weekend to take part in this exhibition which is inspired by the sea. I will have another two pieces going in aswell - looking forward to a day out on Saturday which will involve dropping these off, drives in the beautiful countryside and of course tea and cake somewhere along the way! To celebrate my new look shops (they have both had a wee bit of a make-over) and my up and coming birthday I have decided to have a wee sale. 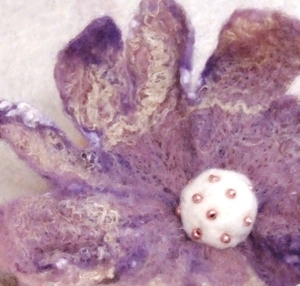 Click onto my shops to view my new wonderful banners! Gilfling Art Shop 20% off ALL prints - I am increasing this to 25% for all my wonderful blog readers (does not apply to postage) - just mention 'BLOG' in note to seller and I shall send you an adjusted invoice. I have also decide to extend my 'soon to be discontinued prints' so that they can also be included in this sale!! Gilfling's Designs Accessories Shop - 15% discount on any order (not including shipping) this increases to 20% for blog readers - again just add BLOG in note to seller and wait for an adjusted invoice. And I really have to give a shout out to Leila of Redheart13 who designed my new banners and avatars. She was a real joy to work with and I think she has done an amazing job - now I just have to get my listings and photographs up to scratch!! Helloo! Just having a really quick pause as I am working up the loft today - inbetween hobbling around on an exceedingly painful foot - I have no idea what I have done to it but it is making climbing ladders that wee bit more interesting! 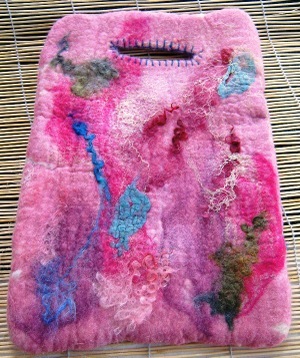 Just thought I would show you a couple of photos of the bag making workshop I took on Saturday which was great fun. Although I really need to give the 'advertising' part of taking these independant workshops alot more thought than I have been up till now. This was only the second one I have taken and there were 2 students but we had the most wonderful day and it made for a much more leisurely pace as they had almost 1-1 attention! I am currently scouting out varying venues for future workshops. 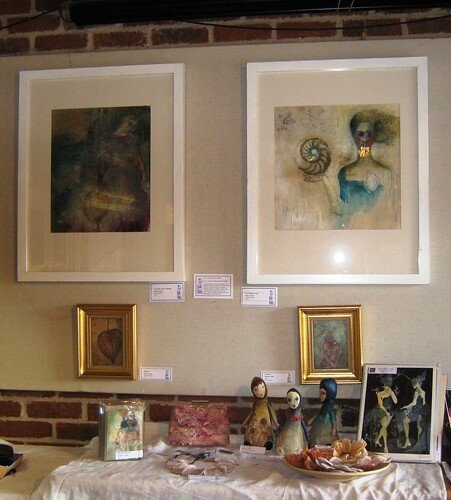 I will still use Edwinstowe which is a lovely little craft centre in the middle of Sherwood Forest but am also looking for venues a little closer to home. I also want to start teaching more 'art' based classes too - not sure about the format yet but the brain cells are working it all out slowly! But as I say, these will only succeed if I get better at advertising - although I am confident when teaching and on a personal level, I am really, really bad at putting myself 'out there' and some of that is down to not really knowing how and where to advertise - but it is my plan to really work on this for my next workshops! To that end I am going to leave a gap in June and book my next venues beginning in July so that I am giving myself enough time (hopefully) to get enough participants. I think also (rather sheepishly - and this is really hard to admit) that part of it is also lack of confidence and the fear of failure. Although I 'know' I am good at this - if I neglect the advertising then I only have myself to blame if no-one wants to come - rather than doing loads and loads of promotion and people don't turn up anyway! Oh dear - I drive myself crazy sometimes. Still, it is something I am working hard on, so I am pulling my socks up, squaring my shoulders and giving myself a good talking to! Above you can see the lovely bags that were made alongside the one I made to demonstrate the various steps in the process. 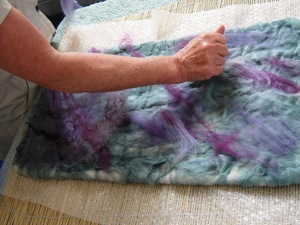 The two ladies were over the moon with their creations and were a pleasure to work with. Right back to hobble up the ladders to get more work done! Every day feels like a discovery at the moment - a delightful exploration, finding my way. I was chatting to a friend the other night, reminiscing as ever on my time at college studying costume. On graduating I had dreams of a career working in film or theatre, travelling the world and doing so many exciting things. Oh how differently my life has turned out. Teaching wonderful people who perhaps have profound difficulties in their lives. Seeing proud smiles and quiet words at the beautiful things they have made. Their confidence growing and that feeling of satisfaction at creating something from scratch and holding it in their hands. One lady said to me "I did not know I could make something so beautiful". These are things that I am hesitant to talk about on my blog as I so want to respect the privacy and choices of the people I have been working with. But in truth I, too am proud. Both of them and their achievements, but also that I have the opportunity to be a part of that and in a whisper I can say to myself that I do feel I am making a difference. I received a wonderful letter recently from the organisation I have been working for, commending me on the workshops I have been taking and the development of the groups I have been working with. I am not very good at talking about this, indeed it feels boastful to even be mentioning it here. But the fact is I do feel a real sense of achievement and satisfaction from the work I have been doing and smile as I think of the feedback I have received. I could never have predicted 2 years ago that I would be teaching workshops to community groups but now I realise that for me, it allows me the perfect balance between this at times self indulgent career of creating, and the thought that I am helping to make a difference, however small it may be, and then I know with certainty that I am following the right path. 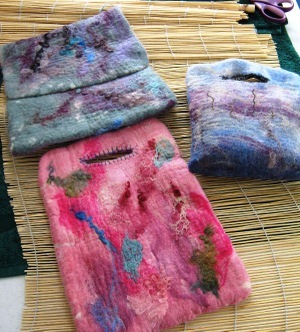 The other discovery is a love of felt-making. Again slightly unexpected since I had not created anything in felt since college where I taught myself the basic skills in order to make a costume. 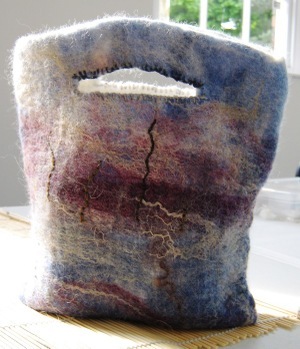 I rediscovered this wonderul craft when I had the challenge of thinking of a textiles subject to teach in my workshops which involved minimal equipment (ie no sewing machines) and knowing that the groups had already been taught hand sewing skills. 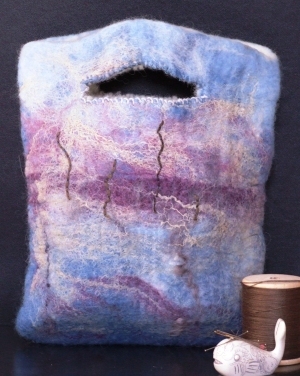 In teaching hand felting, I now find myself wanting to felt everything and it seems to be the perfect way of exploring my love of texture and muted colours and organic shapes in the form of my accessories. 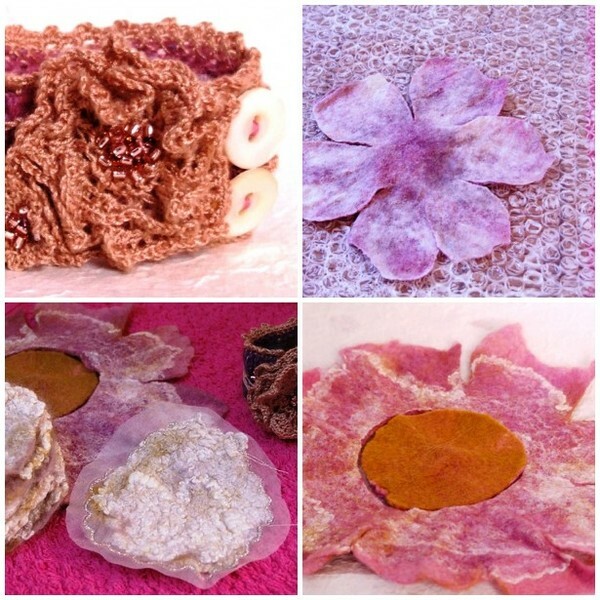 My method is almost like painting with fibres and I love the way I can interpret my ideas for texure and also shapes like victorian style collars such those in my etsy shop now. As I love to explore themes of old, dreams and the magic of twilight in my artwork, so felt allows me to do this in a painterly way with my accessories. That space between light and dark, the hours between sunset and sunrise. Layers and light and ethereal twilight. 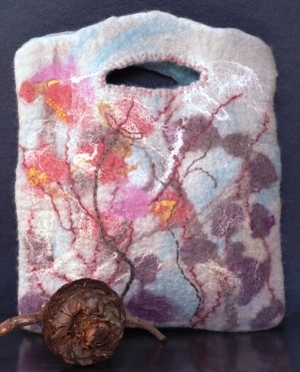 The twilight flower show and In the gloaming hand felted bags now available in my etsy shop! Yup. I sure am. All those works-in-progress projects that have been sitting unfinished for so long - I am making my way through all of them. I have made it my mission this week to start nothing new until all those little bits are done. I also have more work to take down to the gallery in the way of accessories so am just adding finishing touches. So the rest of today will be spent in the loft and then tonight will be movie watching whilst stitching and adding buttons. 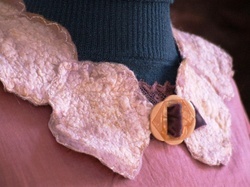 became this beautiful victorian style collar (so lovely that I want to keep it for myself - but more will be on their way!) It is in the shop now! 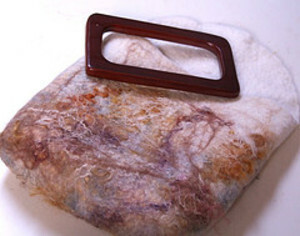 And this unfinished bag is now here in my shop.... Umm how long does it take to sew on a handle and a snap fastening? Oh about 7 weeks apparently. Still things around here are a changin'. What with having no work (or hardly any) I really have to get my act together and it is all happening now! Nothing like the threat of poverty to kick start me into action. Just one question. Why oh why does it take money to make money? I have been scouring the internet searching for potential craft fairs to apply for and when a table costs £50 - £80 ($100 - $160) what is a girl to do? The same goes for exhibitions. I think I may have said it yesterday and I shall say it again today........ Ho hum. Oh and I went to my first knit and natter night last night! Great to meet new people and just get some time away from my hermit like existance. I shall be going again! 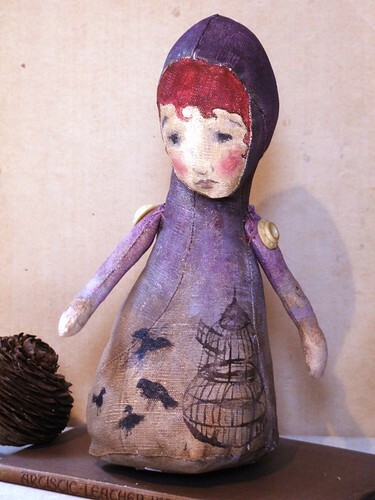 Doll painting in my painting studio tomorrow! I can hardly wait. Gosh I have so many things going on at the moment! So many ideas and so many works in progress. But I am at last getting the chance to get some things finished. 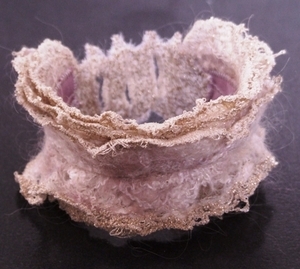 Like this collar which has been made from these felted pieces from a couple of weeks ago. 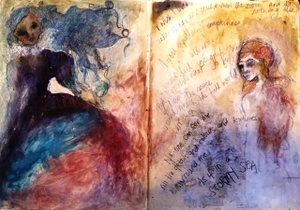 I have also been sketching and developing ideas for some new painting. It has been far too long since I have dedicated time to my art and I really need to ensure this does not happen again! 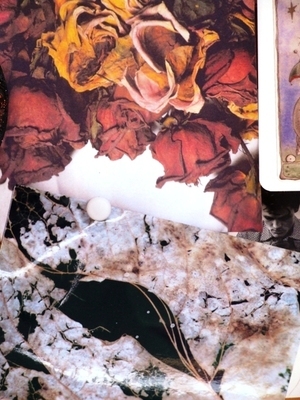 Below is a couple of images from my inspiration board. I can't get enough of these organic and aged shapes, textures and colours. Inspiration for my art and accessories - hopefully all a reflection of me and my aesthetic. But now I am really getting focussed. To be honest, this is a bit of a worrying time. Two teaching contracts have come to an end (they were only funded for a few short months) and although one of the groups has taken me on for more teaching it is at a far reduced rate as it is funded by a different area. I am trying not to worry too much and really just work as hard as I can on my own projects but, deary me it is not always easy!! BUT, I have ideas coming thick and fast and inspiration constantly buzzing round my thoughts so it is an exciting time!! So I leave you with a new journal page. Hope you are having a wonderful week! when one has the most unphotogenic hands. I kid you not. It has often been mentioned that my hands are very childlike in appearance..... which basically means I have the shortest, stubbiest fingers (Mark says 'stubby finger' is actually a very real affliction from which I suffer greatly) the palest skin - I mean really it is very blue. Also my hands have no shape. They are shape-less, with dimples - dimples I ask you!! Well of course you might be wondering why this is such a worry for me. I have to say it is not a 'problem' that occupies a great deal of my thought space on any given day (rent, bills and where is my next job coming from are the thoughts that usually tend to block all other worries from my brain!) but on a day like today - when I at long last have something new and exciting for my accessories shop - well stubby fingers and pale dimply hands all of a sudden become a real hindrance! 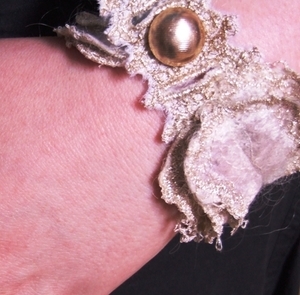 I can't even tell you how many photographs I took this morning of me modelling this cuff. Photography is not my strong point at the best of times - and 'modelling' (even 'wrist' modelling) even less so. And no you are not going to see the ones that were discarded. But you can see this beauty later on today once I have listed it in my shop! I made the bases of these cuffs quite a while ago but have been pondering the question of the perfect fastening ever since, and boy did I take my time reaching a decision. But the first is now finished with another few in various stages of production. I love them, I really do. 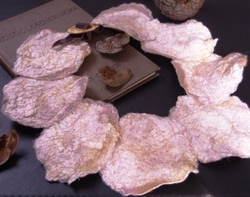 So delicate and organic but with the important touch of Gold that I simply cannot leave out on so many of my pieces. 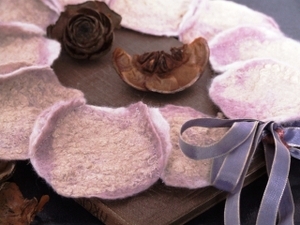 Hand-felted, free embroidered layers and with adjustable button fastenings and a vintage button. Just lovely. More new beauties coming up later this week! and trying to get focussed! Not much posting at the moment but an awful lot of pink. I will be back soon! This is just a quickie as I have been teaching all morning and now have to disappear up to the place known as 'city of felted dance costume' situated in 'loft space heaven' for the entire rest of today and possibly into the night and tomorrow morning in order to get these costumes finished for the performance tomorrow night! 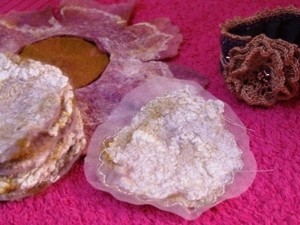 .....but I just thought I would let you know I have managed to make a few wee items for my accessories shop. I had intended on having a whole exploding geyser of a relaunch of my accessories but will now have to make do with just a little trickle of new items appearing spontaneously over the next few days. I had a complete eureka moment yesterday with new ideas for things I want to make though so am going to be working on those next week. 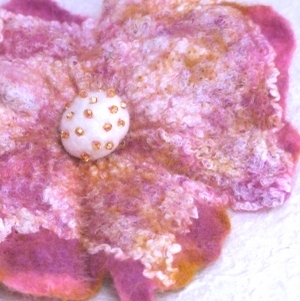 These pretty felted flower brooches are really just a teeny taster of what is to come as I am busy developing designs for what I hope are very original and very unique to me items - think costume, think victoriana, think gorgeous colours and textures - I know I am waiting with bated breath to get them finished and show you them!